Matthew Stockman/GettyCarmelo Anthony hasn’t previously embraced playing a smaller role, something he’ll have to do with the Houston Rockets. Carmelo Anthony is expected to join the Houston Rockets on a one-year deal. The move has raised some eyebrows, as it would seem to slot Anthony into a lesser role, one in which he would act as little more than a spot-up threat on the perimeter. Over one year with the Oklahoma City Thunder, Anthony bristled at the idea of taking a lesser role on the team. Carmelo Anthony is on the move again, having been waived by the Atlanta Hawks on Wednesday after being traded from the Oklahoma City Thunder. Now, according to several reports, Anthony is set to sign with the Houston Rockets on a one-year deal for the veteran’s minimum, $US2.4 million. 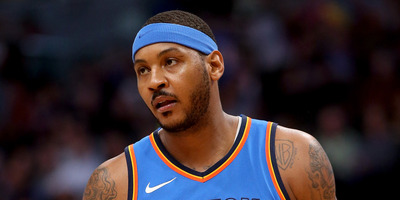 Despite rumours that this deal would happen eventually – the Rockets were said to have also tried to trade for Anthony from the New York Knicks last year – it’s a move with one of the biggest question marks in the league. On paper, Anthony could give the Rockets another scoring threat: a player who can spot up or take over the offence for stretches of time. He’s an adequate rebounder and can pass to shooters out of double-teams when he commands them. Playing next to James Harden and Chris Paul would allow Anthony to smooth into a third-option role, something he’s best suited for at this stage of his career. That role is something Anthony hasn’t been excited to embrace. Over the past year – basically since he left the Knicks – Anthony has bristled at the idea that he would take a lesser role on a team to better fit. Anthony averaged career lows in points per game and field-goal percentage last season but did adopt the role of spot-up shooter and third option with the Thunder. He didn’t perform it particularly well, but on the court at least, he seemed willing to take a back seat to Russell Westbrook and Paul George. But as soon as the season ended – with a first-round loss to the Utah Jazz – Anthony made clear that that role wasn’t for him. Anthony said he sacrificed touches, shots, and his overall role for the sake of the team because he was traded right before training camp. He said there wasn’t time for the team to blend its talent. After Anthony was traded to the Hawks, he spoke with ESPN’s Jemele Hill about his future in the NBA, once again saying he wasn’t ready for a diminished role. It’s unclear, then, what Anthony is expecting in Houston. Anthony appears to most oppose coming off the bench, but it would seem he has no choice but to take a lesser role with the Rockets. Last year’s Rockets team played methodically. Harden and Paul often ran a pick-and-roll or isolation, forcing the defence to adjust before scoring, hitting the roll man, or kicking it out to three-pointers. Harden and Paul both finished in the top 12 in average dribbles per possession among players who played 1,000 minutes. They’re ball-dominant players in a guard-dominant system. It would seem, on paper, that Anthony would be shoehorned into another side role, namely as a spot-up threat from the perimeter. The Rockets are famously reliant on layups, threes, and free throws, and Anthony’s mix of midrange face-ups and post-ups would seemingly run counter to what the Rockets want to do. If he’s forced to adjust his attack points, it stands to reason that Melo would be moved to the perimeter, where he would spend a lot of time watching Harden and Paul dribble the ball – not unlike what he did with the Thunder. It’s possible, of course, that head coach Mike D’Antoni has plans to tweak the system. Perhaps the Rockets plan to mix some of Anthony’s midrange and post game into the offence for variety. Maybe they want to lighten the load on Harden and Paul, both of whom looked tired during last year’s playoffs. Anthony’s usage could climb if the Rockets are willing to bend what last year was not a very flexible system. It’s difficult to imagine that these topics didn’t come up in conversations with Anthony and the Rockets. Surely they’re aware of each other’s desires and expectations. From afar, however, it doesn’t appear to be a good match unless one side is willing to concede more than they have to this point.